During Halloween, do you dress up as a well-known character to go Trick-or-Treating or for Halloween parties? Next time, take your costume to the next level. Memorize your character's well-known quotes, like I did this year. When you meet someone while in costume, recite the character's real lines. Everyone will be amazed! That's what I did this Halloween, and it was so much fun. I wore a Darth Vader costume, but I went beyond the mere costume by memorizing ten of Darth Vader's famous lines from the Star Wars movies. I said the lines while "in character" throughout Halloween evening. It added so much to the experience. I used the Rhyming Peg memory system to do this. You can use this memory technique, which is one of the peg systems, to memorize any list of ten items or fewer. "I can see through the lies of the Jedi." "I have altered the deal. Pray I don't alter it further." "The circle is complete, Obi-Wan. When I left you, I was but the learner. Now I am the master." "No, Luke, I am your father." "You have failed me for the last time, Admiral." "I will not risk damaging the Emperor's prize. We will test it first... on Captain Solo." "Perhaps I can find new ways to motivate them." "She must have hidden the plans in the escape pod." Think about this for a second. Rather than just walking around "looking like" Darth Vader, I was able to go into character and actually speak his lines. Reciting your character's lines adds a whole new level of enjoyment to dressing up in costume. It also makes you look really smart. When someone would come up to me, I'd recite a line like, "You have failed me for the last time, Admiral." In my deepest voice, of course, and raising my plastic light saber menacingly. A couple times someone would asked for a line, expecting the usual "I am your father" quote everyone knows, or for me to draw a blank. Instead, I blew them away by reciting one or two lengthier Vader quotes. The Rhyming Pegs memory technique is actually very simple. To prepare, you first memorize one object that rhymes with the numbers one through 10 (see below). Then, whenever you want to memorize a list of 10 or fewer items, you use visualization & association to create a mental picture, an image that links each item to the image associated with the item number in the list. This makes a lot more sense when you see an example. So let me detail how I used this method to memorize Darth's lines. STEP 1 - Memorize Rhyming Objects. I want you to notice how easy it is to memorize the 10 rhyming object pegs. I'll list the ones I use for you here. Say to yourself, "One-Sun", "Two-Shoe", "Three-Tree", and so on, until you've got it down. STEP 2 - Associate Items with the Rhyming Objects. Once you know the rhyming words, all you have to do is connect what you want to remember with each rhyme word. To assemble my list, I did a Google search for lists of well-known Darth Vader quotes, then selected the 10 quotes I wanted to memorize. Next I created a crazy mental image associating the rhyming word with the quote. KEY CONCEPT 1: Notice the mental images I describe below are not exact translations of the quotes. They don't need to be. A particular image just needs to be a reminder of key words in that quote. In other words, the images symbolize the meaning behind each quote. The symbolic image is enough of a clue to trigger my memory for the quote itself. This really works! KEY CONCEPT 2: It's important to make your mental images crazy, silly, exaggerated, or impossible. That's because the mind best remembers what is unusual. One-Sun. I imagine the Sun (which has a face) staring down at Jedi knights who are lying on the ground. Two-Shoe. I imagine Darth Vader selling shoes in a store. Three-Tree. I imagine a circle of trees with Obi-Wan and Darth saber-fighting in the center. Four-Door. I imagine my father walking through a giant door. Five-Hive. I imagine bees from a giant hive forming themselves into the letter "F" (for Fail) chasing the Admiral character from Star Wars. Six-Sticks. A giant cross made of sticks falling sideways. Seven-Heaven. A wrapped present sitting on a cloud. Eight-Gate. Darth Vader pushing a lawn mower through a garden gate. Nine-Vine. An unconscious Luke Skywalker in a tangle of vines. Ten-Hen. A chicken with a rolled-up set of blueprints in its mouth running into a giant pea pod. The Rhyming Peg method might seem silly, but wow is it effective. After I'd spouted out several of Darth's lines in a row to my neighbor, from memory, he asked if I'd spent all day rewatching the Star Wars movies. "The circle is complete, Obi-Wan." So how much time it actually take me to memorize the 10 lines? Only about 15 minutes! That's it. Then, to solidify the mental images in my memory, I occasionally reviewed them to make the lines stick. As the evening progressed, I mentally reviewed my mental image pegs and Darth's lines in spare moments. All during Halloween evening, I didn't forget any of the lines. It was so much fun reciting them while in-costume. The beauty of using peg memory techniques is they allow you to recall memorized information you might have normally forgotten if you had merely repeated it over and over (rote memorization) without the pegs. The peg techniques act as hooks that allow you fish the details from memory. As I did in this case, you can use memory systems like the Rhyming Peg followed by verbal repetition (Abe Lincoln's favorite memorization technique) to solidify and sharpen the memory of any list. As I've said many times, my natural memory is not very good. But the memory systems, including the Rhyming Peg method, provide "mental hooks" that I've used to enhance my natural memory and make it more powerful. Anyone can do the same, and the more you practice the better it works. 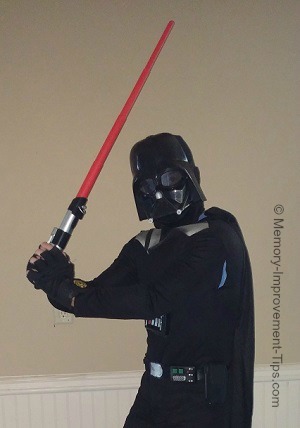 Memorizing Darth Vader's lines for Halloween is just one example of the power of memory systems. Their usefulness is endless. The same Rhyming Peg images (One-Sun, Two-Shoe, etc.) can be used over and over to memorize any type of list you need to remember, whether for work, school, or social activities. You can use it for fun or for more serious memorization tasks. In fact, as reported in Your Memory : How It Works and How to Improve It by Dr. Ken Higbee, research shows "people can effectively learn up to six consecutive lists of 10 words with the same peg words" without getting mixed up. Go ahead and practice using this peg method. You'll find that your mind won't get confused between multiple lists that use the same rhyming pegs. And if the information is important enough that you want to remember it forever, memorizing it first using the peg list gives your brain a head start in moving that information to long term memory. All you really would need to do then, to make it permanent, is periodic review. If you've ever used the Rhyming Pegs technique to memorize a list, I'd be interested to hear about it. Feel free to describe your experience in the Facebook Comments section below.